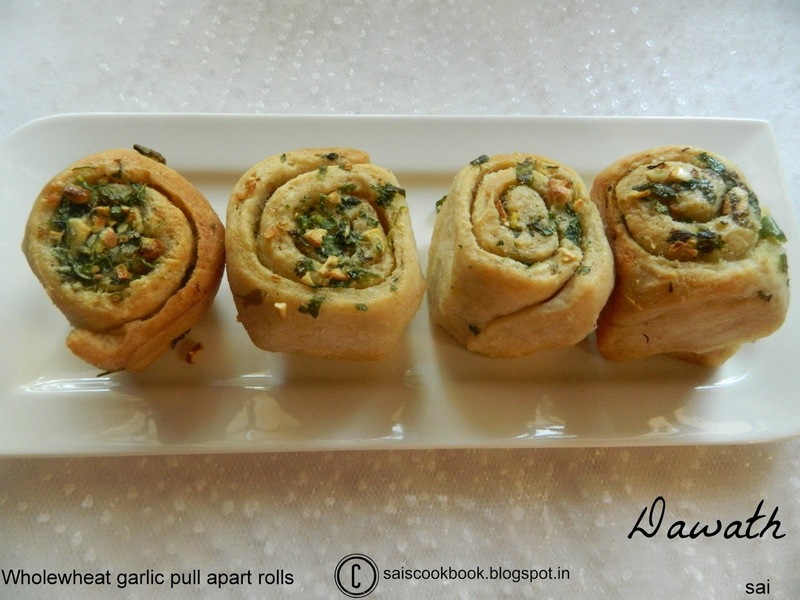 I had bookmarked this recipe sometime back from Divyas Easycooking blog . But since I hadn’t found good quality yeast , it held me from baking . When I had baked Masala bun last time my Papa had enjoyed it heartily , and I had told him about my hunt on good quality yeast . So my dear Papa specially went to a local bakery and got me Prestige brand yeast , an imported brand and guess what ? I can open my own bakery , lol , he has brought 500 g pack . I still don’t know what I ll do with so much of yeast , as of now I have stored it in a refrigerator. When it comes to baking I follow Divya’s footsteps blindly .Thanks a lot Divya for your mind blowing recipe. There’s many more in the ‘to do’ list …The dough had raised just the way it had to . So applauds to me for not not giving up . Stay tuned for more recipes !!! Mix together water,sugar,salt and yeast,keep aside to bloom for 10 -15 minutes. If the yeast is fresh,it will start bubbling within minutes,if it does not bloom,start afresh. In a big mixing bowl,add whole wheat flour maida,pour in the yeast mixture along with olive oil,little at a time and start kneading the dough. 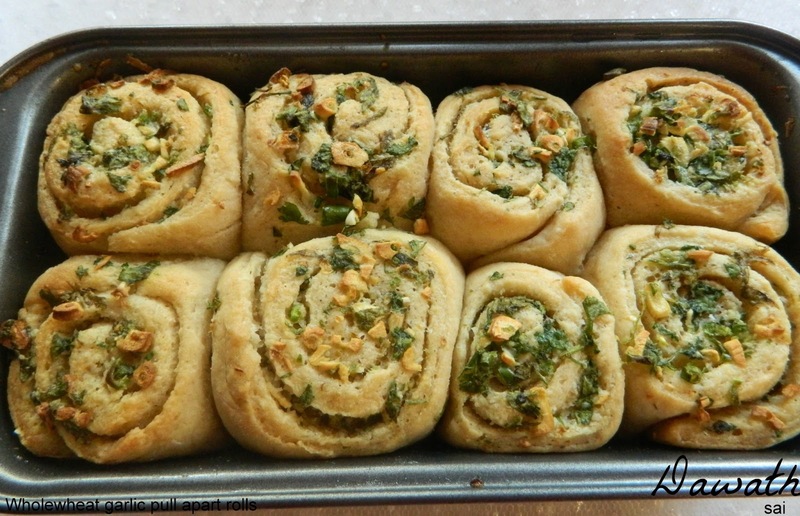 You might /might not require the entire quantity or add as required to form a smooth dough. Knead the dough for 5-7 minutes till smooth and elastic,add flour a tsp or two if you feel the dough is too sticky,but refrain from adding more. Coat the mixing bowl with some olive oil and place the dough in it and smear oil around the dough,cover the bowl with a damp towel and let the dough rise to double its size in a warm place for 45 minutes to an hour. Meanwhile,make the the garlic filling,mix all the ingredients of the filling to a spreading consistency and keep it aside. Grease a loaf pan with some olive oil and keep aside. 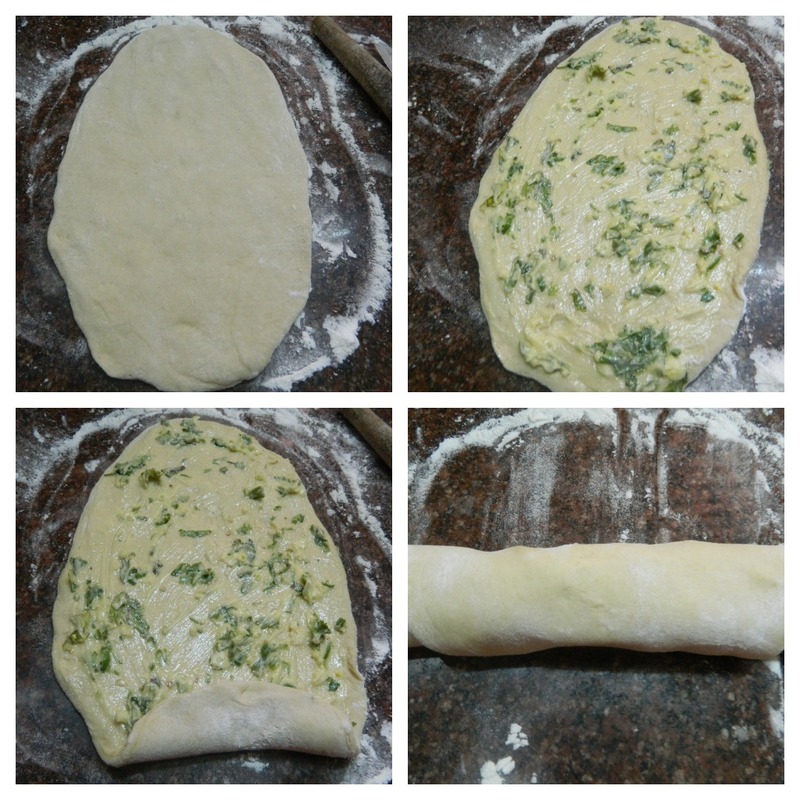 Punch down the dough and knead for 2- 3 minutes,divide the dough into 2 portions. Smear your workplace with some flour and roll the dough into a rectangle,about half an inch thick. 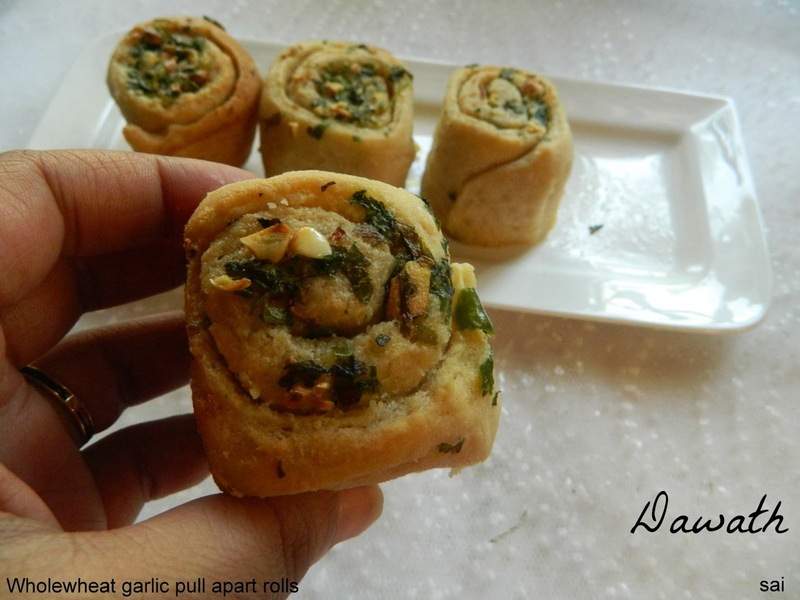 Smear half of the garlic spread,roll the rectangle and cut it into two and further into two more ,so that you end up with four spirals,place the rolls carefully into the greased pan. Repeat with the other half of the dough,apply any remaining garlic spread on top of the dough and brush with some milk. 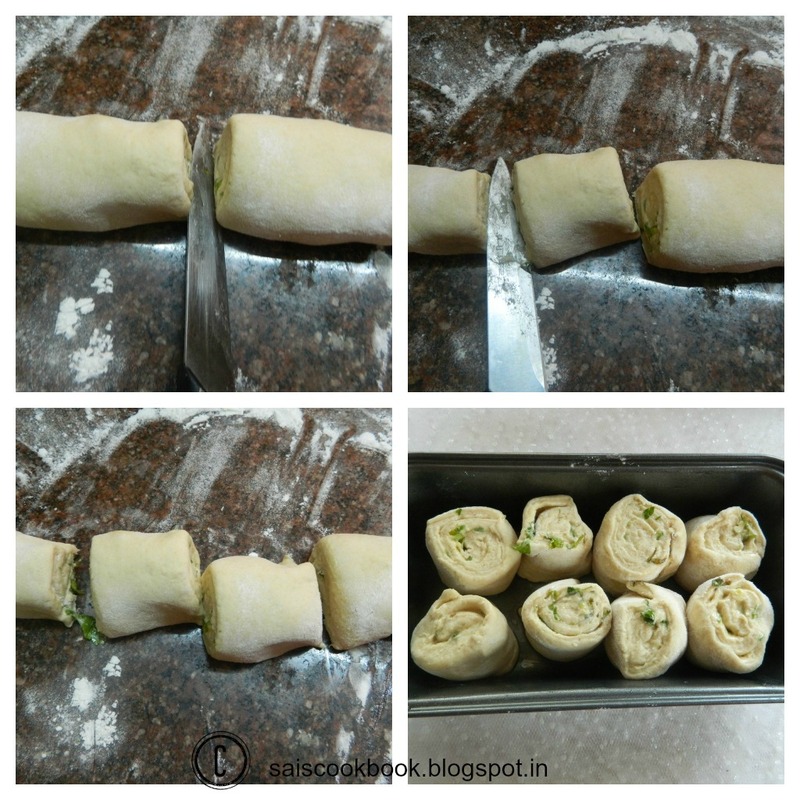 Allow the rolls to proof for 30 45 minutes,preheat the oven to 180 deg C.
Bake the rolls for 20 to 25 minutes or till the top portion of the dough becomes golden and the bread sounds hollow when tapped,if not bake for a further 10 minutes. Brush the top of the rolls with softened butter immediately after you remove from the oven. Run a knife around the edges and immediately remove the rolls from the pan and cool on a wire rack. 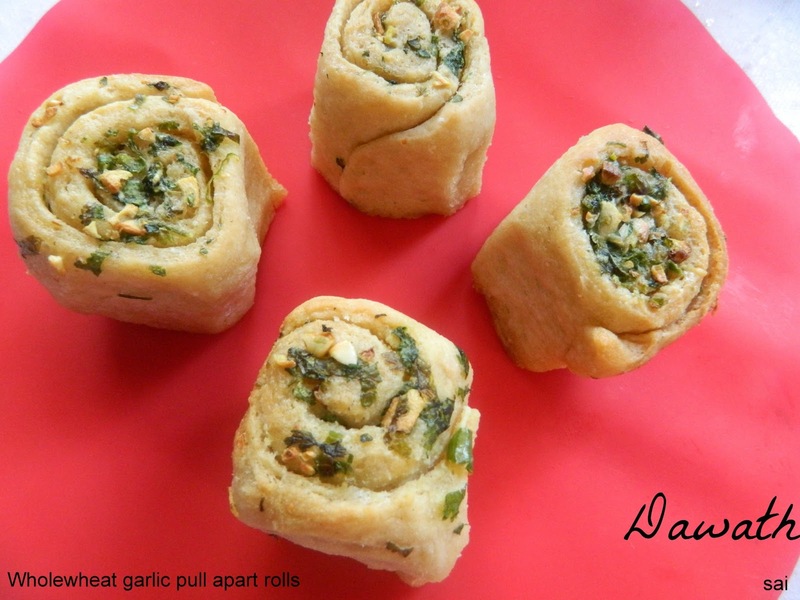 Serve the rolls warm with a hot cup of tea or coffee. So happy to see you baking up a storm:)500gms yeast sounds like a steal! !